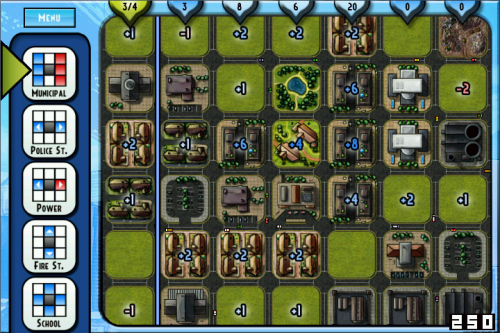 Description MegaCity is a highly original and fun 'one-more-go' style puzzle game. It's easy to learn but hard and fun to master, featuring gameplay that requires thinking, logic and luck. Place requested buildings in the queue to earn points, but watch out: Nobody wants to live next to a landfill site or industrial estate! Everybody wants a nice park or shcool nearby, but the city's budget is limited. This is where you come in... Megacity is a game of planning and thinking ahead to squeeze the most points of out your citizens by clever town planning. And if it all goes wrong, it's their fault for electing you mayor, right? Megacity is a real thinking person's game, which appeals to and is suitable for all ages. Controls Mouse control. Place requested buildings in the queue to earn points, some buildings give positive effects to their surroundings, others negative. A full tutorial is included in the game. Nice concept! I like this #puzzle!